As a marketing consultant one of the number one complaints I hear from small businesses is the time it takes to work on their marketing. They know they need to be posting on social media and emailing customers along with all the other tasks of a business owner such as accounting and scheduling. But what they really want to do is just focus on getting the job done and servicing their customer / clients. I am passionate about working with small businesses and I totally get it. Marketing takes time and while it is critical to a successful business, it is not a clearly trackable ROI. That’s why I always like to make it a priority to research and personally test new marketing tools that might make the life of a small business owner easier. Email is still king and your email list is gold. So are you sending out monthly email newsletters or does the time it take to build them or the cost to hire someone prevent you from doing so? In my quest to find a better solution, I have discovered a quick, easy, and affordable solution. A new service recently launched called Tidings. 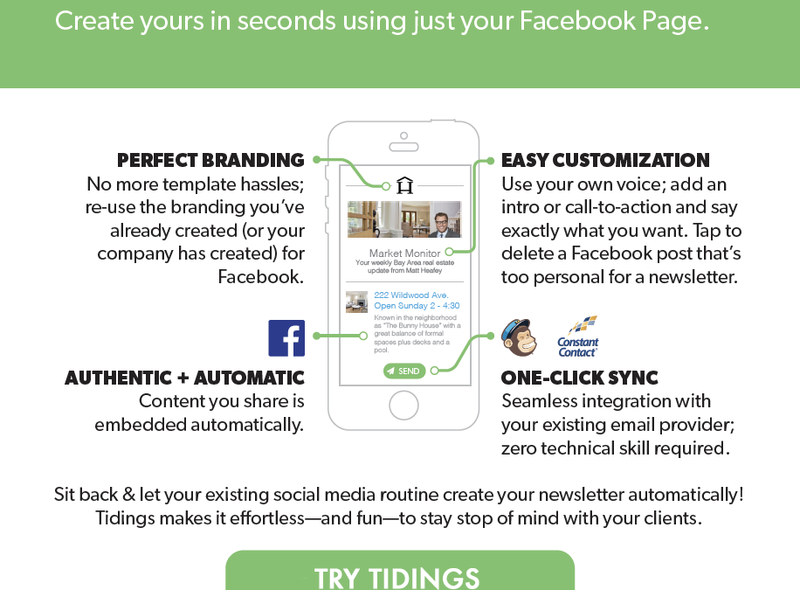 Tidings allows you to create instant email newsletters using just your Facebook page and content that you are already publishing. You can quickly customize the newsletters adding your own branding, messaging, and even adding your monthly blog posts. It now only takes about 5 minutes or less to send out an e-newsletter to your list — and the best part, only costs $19 a month for 1 newsletter! I love this product so much, I’m thrilled to have recently become a Tidings Agency Partner. You can now sign up directly thru our website and when you do, you’ll receive 10% off! The first three weeks are free so go ahead, give it a try and see for yourself why I feel this is the perfect solution to sending out quick and easy e-newsletters! To start your trial and get your 10% off offer, enter your Facebook page on our Tidings Launch Page.